You will be given a reference e-book to read which has 307 pages And the test will be based on that e-book , you can take final test within 1 year of purchase. Supply chain management (SCM) refers to the process of managing a network of interrelated businesses which is involved in the required stipulation of packages for products and services by the customers that are part of a supply chain. The process also involves properly storing raw materials, work in process and finished goods starting from their point of origin up to consumption. Experts also define SCM as the act of designing, planning, executing, controlling and monitoring all the activities within a supply chain while aiming to create net value, leverage logistics worldwide, build an even more competitive infrastructure, synchronize supply with demand and measure global performance. Anyone who wishes to become an SCM expert should be committed towards earning his supply chain management certification as this will allow him to learn the ins and outs of the process. If you are one of the many people who wish to take up a supply chain management course, then you have to become more familiar about the three basic flows used in the process. The first one is the product flow which involves moving goods from suppliers to customers along with any service needs or customer returns. The second one is the information flow and this refers to the process of sending out orders while also regularly updating delivery status. The last one is the financial flow which involves payment schedules, consignment, credit terms and title ownership arrangements. It is also important for you to improve your skills in using the major types of software for SCM. These include the execution applications and the planning applications software. 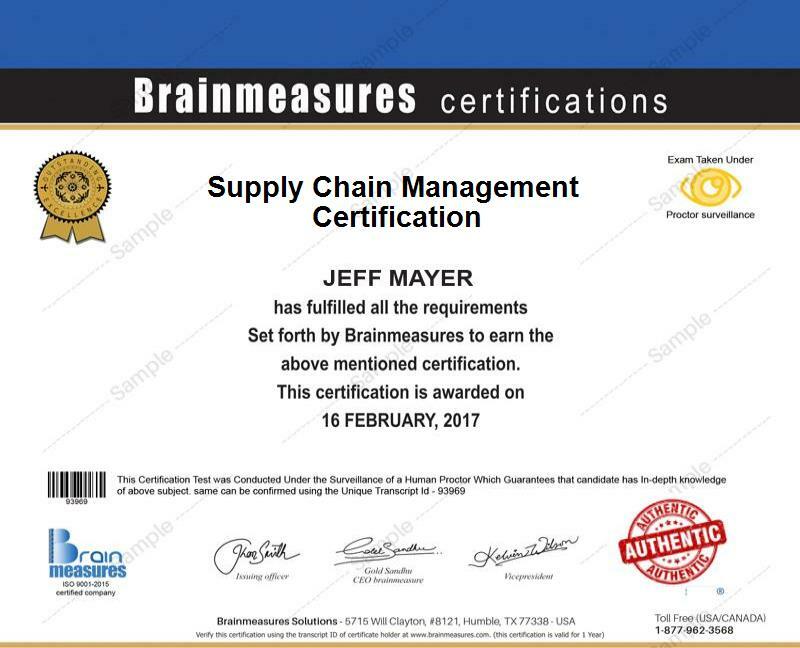 If you are an aspiring SCM expert, then it is best for you to take part in the supply chain management certification program from Brainmeasures. This is just one of the many reliable programs offered by this popular online certification and testing company. The supply chain management certification program from Brainmeasures has become popular at present because it is guaranteed to be professionally developed while following world-class testing standards. It will never be impossible for you to learn everything about how the supply chain management really works if you take up this certification course. Another advantage of enrolling in the program offered by Brainmeasures is that it only provides its certificate to those who have the skills and knowledge in successfully handling their responsibilities and tasks as an SCM expert. This means that your knowledge and skills will be thoroughly assessed with the help of the online management exam created by experts in the supply chain management process. A comprehensive knowledge about how the supply chain management process works can benefit a lot of people in the business industry. The supply chain management certification program from Brainmeasures is primarily designed for business executives who are responsible in deciding the type of supply chain needed by their business organizations and the specific amount that they need to establish it, for business managers and other professionals who are tasked to build and operate some portions of their company’s supply chains and for those who desire to fully understand the major challenges and opportunities in the supply chain so they can quickly and intelligently participate in conversations related to the topic. You should also take note of the fact that as a supply chain management certification holder, your average annual salary will grow. According to indeed.com, the average salary for supply chain managers at present is $90,000.